The hosts continued the winning run in the T20 series as well. South Africa, having a 1-0 lead in the 3-match series, now travel to the SuperSport Park Centurion to face Sri Lanka in the 2nd T20 on March 22, Friday. Keep reading to find out South Africa vs Sri Lanka 2nd T20 Match Prediction. Sri Lanka dominated in the Tests while South Africa reigned in the ODIs. Both the contests were heavily one-sided. But as the action moved to the shortest format of the game, the fight became intense. The first T20 went right down to the wire as it ended in a tie. Both the teams ended at a score of 134. Both the sides had their chances of winning the game. But none of them could capitalize on the crucial moments. After a long time, an international game was decided by the Super Over. South Africa batted first and scored 14 against Lasith Malinga. Imran Tahir then proved his worth as he kept the opposition down to just 5 runs. 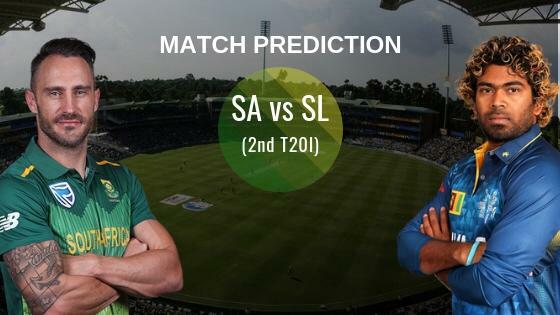 South Africa vs Sri Lanka 2nd T20 Match Prediction: South Africa will be without the services of key players for the remaining games. The likes of Faf du Plessis, Quinton de Kock, Kagiso Rabada won’t feature in the series anymore. This is the best chance for Sri Lanka to pull off a victory in the limited overs leg.